Loreto Mexico, a small port on the Sea of Cortez in the State of Baja California Sur, is a historic town of 10,000 inhabitants that welcomes lots of tourists each year from the United States and Canada. In fact, direct international flights arrive in the local airport, Loreto International, every day. Fishing is Loreto’s main tourist attraction. Visitors can hire a “panga” (a small, flat-bottomed boat) with a guide and set out into the Sea of Cortez for “Mahi-Mahi” (also called “Dorado” and “Dolphin Fish”). Local restaurants will gladly prepare the day’s catch and serve it with beer, margaritas and all the trimmings. Several modern, fully-equipped fleets of fishing boats leave daily from Loreto’s harbor. Dorado, marlin and sailfish are most plentiful in the summer season. In winter, Loreto offers an abundance of yellow tail. Seabass and snapper can be caught year round. Other catchable species include Grouper and Tuna. Popular fishing tourneys attract anglers from all over to Loreto in May, July and September of each year. Loreto Mexico also offers tourists a selection of beaches: Nopoló (to the south of town), Juncalito, Ensenada Blanca, Agua Verde and San Bruno beach (to the north of town). A full range of beach activities and attractions are available, including sailing, snorkeling, diving, and motorized water sports. Diving in the Sea of Cortez around Loreto is particularly good because of the excellent visibility and the variety of marine species that divers can find. Sea kayaking is also popular and widely available. The Hidden Port Yacht Club is active for organized sailing events. 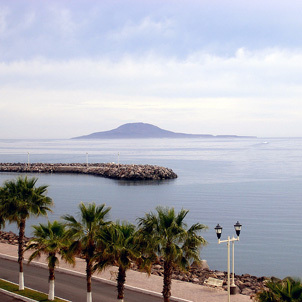 It is in a small, natural harbor to the south of Loreto proper. In Nopoló, just few miles to the south, golfers will find an 18-hole, par-72 course, and tennis enthusiasts can enjoy a first-rate facility with 8 tennis courts. Hikers will find the allure of the nearby mountain range, called “La Giganta,” hard to resist. The ridges are laced with trails, through canyons and over rock outcroppings. Cave paintings were discovered in this mountain range just 15 km to the west of town in a place now known as “Cuevas Pintas.” About 60 km to the north of town more paintings were discovered at “La Pingüica.” Visitors are welcome in both locations. Several campsite locations are available in Loreto and environs. Informal camping along abandoned stretches of beaches is also permitted. Loreto has also become a popular off-road racing venue, with the annual Loreto 400 and the Loreto 300 miles racing events in September and December respectively. Loreto was the first Spanish colony on the Baja Peninsula, founded by Jesuits in 1697. Visitors can learn about Loreto’s historic past at the Jesuit Missions Museum, next to the old and still well-preserved parish church, Our Lady of Loreto. The two buildings house much religious art, tools and weaponry from the 17th and 18th centuries. Our Lady of Loreto is the starting point for the historic route of the Spanish Missions, which led north well into modern-day California, and along which the several Spanish Missions were built in the 18th century.